Photo courtesy of Ozarks Regional Food Policy Council. What makes a local food system? That’s what the Ozarks Regional Food Policy Council set out to discover through their food system assessment for the 20 counties surrounding Springfield, Missouri. Their findings show the strengths and weaknesses of the local food economy. 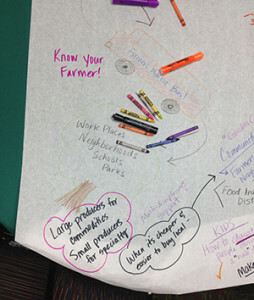 The process also, brought together stakeholders from across the state to move the local food system forward. They determined a need to build more food hub facilities, while giving small growers the business resources to move their company forward. “It really takes a community to solve the issues; you can’t take something that’s been done anywhere else and stamp it down here. Every community is different and the Ozarks are certainly unique,” says Dr. Pam Duitsman, a nutrition and health specialist for the University of Missouri Extension and member of the Ozarks Regional Food Policy Council. During the process, Duitsman found the dialog enlightening. The conversations led Duitsman to an informal survey of local buyers, grocers and large institutions to discover what they were looking for in a local food system, including what expectations buyers had of producers and what barriers stood in the way of creating a stronger local food economy. The assessment and research took six months to complete, producing an executive summary and a 12 policy recommendations, including working closer with local schools to incorporate food and agriculture curriculums and buying from local producers, the creation of a local farm financing collaborative, business and marketing resources for farmers, the marketing of local food, awareness of food deserts and the creation of food hub facilities to connect local buyers and producers in a concrete and consistent manner. “We need a middle network that connects all these dots,” says Duitsman. With the recent addition of food hub expert Patty Cantrell to the team, Duitsman is confident that food hub infrastructure will move from a nice idea to a permanent part of Missouri’s economic development planning, and bridge the gap in the conversation between those who want to grow and those who want to buy. For Duitsman and the stakeholders of Southwest Missouri, next steps include completing their current work on a food hub feasibility study, reinforcing local relationships, helping local buyers source 20 percent of their food locally, initiating and facility infrastructure projects and continuing to provide education to everyone involved in Missouri’s food future.